The Best Western Los Angeles Worldport Hotel is ideally located in the center of Wilmington. Come and experience our hotel near the major tourist attractions. Best price guaranteed and exclusive deals. Take a well-deserved break in our relaxing hot tub and outdoor swimming pool. Stay at this Wilmington hotel located right off the 110 Freeway and enjoy a host of convenient amenities while traveling in southern California. The Best Western Los Angeles Worldport Hotel is well situated for both business and leisure travelers near the Long Beach Convention Center, the Queen Mary and the Long Beach Aquarium of the Pacific. Families will especially enjoy a trip to Disneyland®, Universal Studios® Hollywood or Knott's Berry Farm® amusement park, all just a short drive from the hotel. Guests will also appreciate the variety of nearby dining options including Ports o Call Restaurant, 22 St Landing Seafood Grill and shopping center at Del Amo Fashion Center. Each well-appointed room in this Wilmington hotel features free high-speed Internet access, free long distance access, an iron/ironing board, coffee/tea maker and hairdryer. All guests can begin the morning with a complimentary continental breakfast and newspaper. Visitors will also enjoy the outdoor swimming pool and hot tub. A friendly staff is prepared to ensure a comfortable and memorable stay. Make an online reservation today at this Wilmington hotel! Enjoy your stay. Excellent stay and great staff! The free breakfast is so good, especially the waffles! Spacious, clean room with everything we needed. The pool was great and sauna was comfortable. Will definitely be back again! Very friendly and helpful staff, Josephina, clean and comfortable room, great continental breakfast selection and so convenient to stay before our cruise. Reasonably priced-The free 7 day parking in their underground garage was a cost saving blessing. "Free Cruise Parking for 7 nights"
This hotel was recently remodeled and in a great location for anyone interested in driving and cruising from San Pedro or Long Beach ports. Bed was comfortable. Breakfast was adequate, with make your own waffles, powdered eggs, sausage as hot items. A lot of cold options to choose from and hours of breakfast are 6-10, which was very convenient. Denney's restaurant is next door for more options. We were so impressed and very satisfied that we will definitely return in the future. Area, was nice clean rooms organized breakfast area delicious, I enjoyed this day at the hotel made us feel very cozy and comfortable inspite that this trip was for a family funeral situation we were please and slept like babies. Great for 'mobility' people. 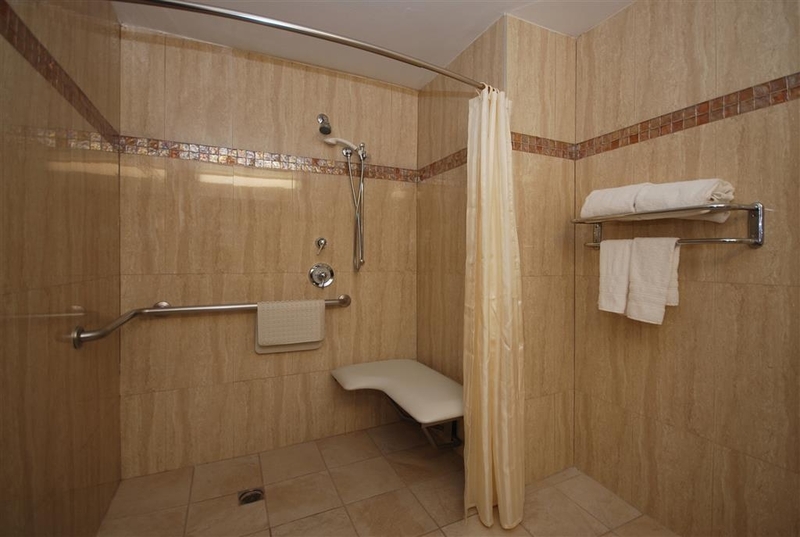 Totally ADA compliant 'roll-in' shower, toilet and bathroom area. Room was accessible, as well as all public areas in the hotel. The free courtesy water bottles surte beats chocolate mints on the pillow and athe free fruit and granola bars in the lobby are way cool. BTW; the Red Delicious Apple was probably the juiciest, sweatest, ripest apple I've had in a long time. "The price and location were perfect for us." We stayed at this hotel because our original hotel was full when we decided to add an additional night. The pluses: #1. THE COST. It can't be beat. It's super close to the World Port where we took the Catalina Express to Catalina Island. FREE Parking. Free breakfast. Free newspaper. The room was large and clean. (Nice since there were three of us.) The bathroom looked like it had been recently remodeled and was sparkling clean. The drawbacks: #1. The street noise is awful. It is next to a busy street and the freeway. Convenient but noisy. (They did provide earplugs.) NO MICROWAVE. :( It was a little difficult to get into the parking lot. The parking spaces are tight. I would recommend it if you don't want to pay for a hotel you really aren't going to be in. We will probably stay here again. Stayed at this hotel to park our car while going on a cruise. The accommodations were nice and the staff were especially nice. We parked our car in a basement covered parking garage that was easily accessible to an elevator. Very nice not to have to worry about the safety of our vehicle! The hotel staff arranged our taxi to the port. There is not a lot of dining options within walking distance but there is a Denny's right next door. "Non helpful staff, scary neighborhood"
I checked in about 11:15 pm and just wanted a couple beers. I asked where I could go but a 6 pack. I was told across the road. You had to cross at the light. It was several hundreds yard walk. Homeless people, long lights... I got there in about 10 minutes but no beer sales after 11 pm. I've lived in some of the worst parts of New Orleans. This was scary. We got the 4th floor corner room. We walked past a dozen rooms being renovated all the way to the corner. Tub wouldn't drain, ooh yes and bring your own water. "Loved this for an overnight stay before cruising"
This Best Western is in Wilmington, less than 15 minutes from the dock. We parked for 5 days underground for free, and took a Lyft back and forth to the dock. Between parking and the lovely breakfast, it feels like we stayed in the hotel for free! It's right next to a Denny's (that serves wine and beer!) and across from a convenience store to pick up a few munchy and sippy things for the room. Super easy after a long drive. There's also a few drugstores on the same road for last minute shopping before the cruise, I highly highly recommend. Very friendly staff assists with easy check-in and accommodations at any given time. Pool & hot tub adds to the option to relax as well as breakfast buffet with variety of choice of food and juices. Excellent coffee as well! "Best Western in Wilminton Ca"
This room was FILTHY and the carpet was stained everywhere and they had ROACHES crawling all over the place . We shook out our bags and left .Didnt care about the money we paid. Would rather take the loss. Don't stay here !!!! "Disorganized, less than helpful staff"
Arrived on a Wednesday night around 950. Did the stay and park package with the cruise we are taking where we can park for free at the hotel if we are taking a cruise. Told the girl at the counter about the package we had. Received a parking ticket that only showed us parking one night. When I brought this to her attention she corrected it and then told me to fill out the vehicle information form they had. Then processed to tell me to go park in the underground garage as it is more secure for long term parking. Sounded good. Pulled out of the lobby and the parking garage underground is closed off. Went back inside and she is shocked and doesn't understand why it would be closed. Another person working heard us and commented that it was closed off "a while ago" and won't reopen until morning. Advises us to park anywhere and we can relocate in the morning. At this point my confidence in this place is waning. We finally get up to our room and the traffic from the freeway was awful and we could hardly sleep. And the AC was very noisy. But sleep we finally did. In the morning the breakfast was decent. Pretty standard hotel breakfast. The front desk made up for some of the issues the night before by allowing us to use some scissors to get new insoles that I got for my sons shoes. However, I checked before we left for the cruise on the parking issue as I had no confidence in the person working the night before and she only had us listed as staying one night still. So I had to fix that issue again. Maybe she was new, but this place needs to step it up. Especially since the noise issues are there also. "A hotel well located, very good room and food – not cheap." Positives – Best help yourself breakfast we had in the USA, large room with every facility you would want. Negatives – On the pricey side. For some a bit of a way out from Long Beach. Staffing quality variable. Details The hotel is situated along the main raod and metro link to Long Beach. We stayed for 1 night in Oct 2018. The cost for the room was £102 including a very good breakfast. The clean hotel room had a desk, space for clothes, two double good sized beds, seating area. It was large with a modern clean feeling. There was the usual bathroom with toiletries and complimentary coffee/tea. There was a good sized LCD TV with plenty of channels. Wi-Fi was variable. The staff varied from being helpful and friendly to ‘not that bothered' and lacking in friendliness. When we left we were ignored! The help yourself breakfast included cereals, juice, tea/coffee, porridge, fruit, bread for toast, pastries, yoghurt. Hot food was scrambled egg and sausage. Yes a good breakfast with plenty of choice by USA standards. It was quiet and we slept well. Overall we would recommend it even though it is pricey with 8.5 out of 10. "Best Hotel for the Money in Los Angeles"
Everything at this Hotel is excellent from service to rooms to the free breakfast. For the money you will not find anything like this in LA. Will stay at this hotel again if I go back. Close to Long Beach, Palos Verdas and the Freeway back to the Airport and Los Angeles. I checked pricing all over the city this was the best. "Friendly staff, Very nice rooms, Great price..."
I travel a lot for business. The staff here are great and are helpful with what ever you need. Nicely remodeled rooms and it's a good price. It pays to be a best western member... There are restaurants in the area and this is close to many interesting museums and a variety of attractions. "noisy room with bugs, disgusting muddy water in the sink"
Stayed there for two nights. The hotel is next to CA1 and I110 and it's very noisy during night. There are bugs but unfortunately I forgot to take a picture of those. The worst thing is, when we came back from universal studio on the second day, the sink was full of disgusting muddy water. the onduty mgr said they don't have anyone to help clean it since it's too late and we had to clean it by ourselves. I was told they will investigate this issue and call me back, but I haven't received any callback up to now. The staff is friendly, the rooms are OK (clean), beds are fair, breakfast is filling, but not very impressive (the eggs were consistently watery every day). While the rooms and bathrooms were clean every day, the hallways and stairways definitely weren't even halfway clean. There's not much parking at this facility, and if you get there late you'll really have trouble finding a spot (also, the elevator to the lower level closes at 10 so that can be a problem). It's VERY difficult to get into the hotel from the Pacific Coast Freeway as it's a really busy road. Making a right turn into the lot is tough! It's a haul to get to anywhere north, but it's not too bad a drive to Long Beach and there's lots to see and do there. "Visited family and went to Universal Studios"
Nice rooms. Ok breakfast. No problem with parking. Enjoyed trip. Only problem was the room was street facing and the noise from the road and being next to the freeway got quite loud in the morning. But otherwise not bad for the price. "Not too bad, but could be better"
Not enough hot water for showers; bed creaks when you move even the slightest. Lighting in room was poor. The breakfast was very good; the help average. We stayed here before so we returned. Things have gone downhill. We were told they are renovating; why they took so long to do this, I am not sure. Very pleasant experience. We have stayed here before and will return again. Quick check in and out. The room was clean and bed and pillows were comfortable. Love the easy and close exit and entrance to the freeway. Love staying to this hotel. Its close to everything. Bed is very comfortable and clean. Free breakfast and parking is a plus. Staff is very friendly and accomodating. Will defenitely coming back.. only downpart is driving to the entrance of the hotel. Pacific coast HIway is a busy street and you have to go around denny's and make a right to get to the entrance of the hotel. But other than that it was a great hotel for me. I love staying at this hotel. Bed is very comfy and clean. House keeping daily. Free breakfast and parking. Friendly staff and very accomodating. Will definetly come back soon. Only downside was driving to the entrance of the hotel is alittle bit challenging especially pacific coast Hway is a very busy street. Excellent. Everything was great. Room was comfortable and clean. Didn't use the A/C as it was cool outside so just opened the window for night time ventilation. Bathroom had a bathtub and toilet and the sink and vanity was in the main living area. The complimentary breakfast is what you would find in any hotel, basic offerings. The area was neat and clean. The place is not mind-blowing, but it is clean and well located. Public transportation is never a strong point of LA, but with the bus stop right in front of the hotel it is not too difficult to get to the down town of Long Beach. The room wall is however slightly too thin, and you can be disturbed by the people next door. There is still room for improvement for breakfast in terms of both variety and taste. But, hey, given the price, it's not too shabby at all. Enjoyed my stay at this location! I didn't wake up on time yo make it to breakfast but loved there was a Denny's right next door! Staff was friendly despite us arriving at 2:30am! No complaints at all! "Nice hotel a bit noisy, freeway too close"
The parking ain't the greatest, not much to do in that area. The ggod thing is it's very close to the freeway, which is also bad if you're trying to get into this hotel during peak traffic time. This place serves it's purpose I guess, nothing fancy or special, it could be worse I guess. This hotel was chosen only because we were unable to secure a room at other Best Western's in the Los Angeles area. The property itself is acceptable. Friendly enough staff and clean rooms, but amenities (or lack thereof) tend to tell the story of the area and guests of this hotel. A lack of towels in the bath/shower was the most glaring sign that the clientele was not to be trusted. Free breakfast, a staple of Best Western hotels, left a great deal to be desired. Sausages served needed to be cut with a knife into bite-sized pieces, but the plastic utensils offered were too flimsy to do the job; scrambled eggs were tasteless. A decent place to stay in a pinch, but not one I would recommend or return to personally. "Nice staff, comfortable room, free parking"
We used this hotel before and after a cruise. It was quite comfortable and the staff were friendly. It's best to ask for a room facing the back, as there was more traffic noise from PCH when we had a room on the front side. The breakfast was simple but fine, and free is always good! The air conditioner was not too noisy. We especially appreciated the opportunity to leave our car for free during our cruise. It was parked safely in the underground parking lot. 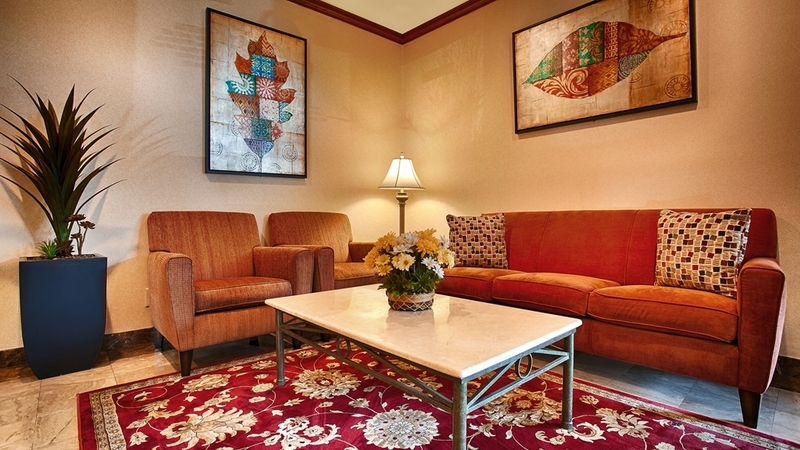 "Great staff, roomy and clean hotel"
The hotel is conveniently located next to the freeway. You will need a car to get around to the amenities although a Denny's is next door. The staff was friendly and helpful. Had to call maintenance once to fix a stuck drain, and they were prompt and took care of it. Will stay here again for future cruise sailings out of LA. Best internet connection speeds I have found in hotels in the area. Very clean rooms and polite staff. Made the stay very comfortable. Only down side is the entrance is right next to a busy road and can make getting in difficult at different times of the day. Everyone was really friendly, the rooms were clean and comfortable, the breakfast was great (coffee could use an improvement but I'm picky), the hotel was conveniently located around beaches and there was a Denny's within walking distance which was nice. I'll stay here again! this hotel isn't bad at all. nice caring staff...fits a average budget for hotel stays. the location is very attainable in the california area...anyone who needs a decent place to stay may appreciate this hotel. I stayed here for 4 weeks on a business trip, spent a lot of time working from the room. Excellent Internet connection. Breakfast is free and very good. What makes this hotel spectacular are the staff, friendly, efficient and welcoming, nothing was too much trouble. Would happily stay here again and hope to soon. "Good family spot near LAX. The rooms were decent. Love that they can sleep 5 people comfortably. Morning breakfast w"
Good family spot near airport. The rooms were good, clean and comfortably slept 5 Didn't make it to the pool. Breakfast was good. Staff very friendly. Only issue was key didn't work very well and staff couldn't fix it. For the price, the hotel was okay. I expected a bit more for what I paid comparing to similar priced hotels. However, it wasn't a bad experience. Here is the list of pros and cons... Pros: Affordable, rooms were clean, spacious rooms, good customer service, right off the freeway, good location Cons: Free breakfast (No cooked eggs), very limited selection, this is probably my worse experience with free breakfast from the hotels I've stayed, guess you shouldn't complain when it's free!! Haha but I am! Parking spaces are too small, again it's free so.... The t.v. is outdated with poor picture quality, the lightbulb in the room burned out on the flip of the switch (too tired to ask them to swap), old elevator. Well, there you have it. That's my opinion on this room. Would I stay here again, sure, if I don't find a similar priced room from a higher star hotel or brand. But other than that, it was a good experience and recommended for a nice clean room! Oh, there is a dennys within 1 minute walking distance from the hotel so if you aren't satisfied with your meal here ha! Hope this helps!! The hotel is located right off the fwy, the rooms are very spacious. The parking area is a bit small. If you have a suv it can be tricky to get a decent parking spot without having to grab a piece of the parking next to you.The breakfast was ok. if you ask me the hash browns needed to be cooked a bit more and would've loved to have some scramble eggs instead but for being a complimentary breakfast it was good. The staff was very nice and helpful. I stayed here for five nights. The location of the hotel is okay, except getting in and out of the hotel is a nightmare. There is a major intersection right there. The parking at the hotel is okay if you have a smaller car, but if you have a larger vehicle it is difficult. The room itself was great, nice firm bed with lots of pillows. It was clean and well kept. The outside had a pool with a hot tub, is wasn't huge but it did the trick. The breakfast was disappointing, if you were looking for your standard eggs, sausage and toast breakfast... it wasn't here. Would I stay here again? Maybe. It really wasn't that bad, the price was a good value for the money. Unless you know how to get into the parking lot, it may be a little odd to figure out at first. Once that is done parking is plentiful. Otherwise a good stay. Breakfast was a rather typical continental style and was also good. "Very Clean Hotel Good Location"
Very clean Hotel and room. Courteous staff. Breakfast included with nice variety choice including cereal, bagel, muffin, fresh cooked waffles, eggs and sausages, fruits and yogurts as well as coffee, tea, orange juice and other fruit juices. Free Wifi works great. The only negative was the TV resolution screen which was not very good. Also, the proximity of the highway makes it a little noisy but it did not disrupt our sleep. Great little hotel in between San Diego & LA. Price for two beds, free breakfast & free wifi and free parking was just $115 a deal. Rooms were nice and comfy. We were happy with our selection, especially since we didn't plan to be hotel except to sleep. We stayed here as it was the closest hotel to friends. The facility looks new and is very nice. The location is very noisy, road and freeway nearby, lots of traffic. And I lost count of the sirens that went by. Very good service. The people works there are helping us to have a good time. Room is clean and provide very good breakfirst. This Best Western is located in the busy portion of high way 1 and some time it is not easy to get in. Let's begin with the monotone front desk associate. While the young woman was not rude, she held no personable customer service attributes and snarled at me when I asked why I needed to sign a nondisclosure regarding smoking in the rooms. She was intense about it and made me uncomfortable. We're not smokers, period. Our room smelled like an ashtray though and where possible hookers urinate on their clientele. The smell was atrocious. My husband hates confrontation and insisted that we not complain, so I took matters into my own hands. I went to target to purchase our own sheets and blankets because ours smelled and had stains, yuck! The breakfast was well below standards, even for BW. The eggs appeared the worst, we left and found a nice cafe within reasonable price range. While I know that much of a vacation isn't spent in your hotel room, I'd still like to experience comfort while I need to be in there. The toilet hardly flushed and the shower did have proper water pressure. I've experienced better pressure in a rinky dink trailer of South Phoenix. For the same price as other competing hotels, you need to step up your game or lower your prices. Paying almost $300 for two nights of scum, was DISAPPOINTING. I will never stay at BW again! Apologized for the staff attitude at front desk and felt uncomfortable upon check in, and thank you for telling us all issues. We are taking this opportunity to keep you informed that breakfast, lobby and all guest room will be starting renovations in late July. Hope you can come back to see us again. I enjoyed my stay this was one of my favorite Best Western Hotels I've ever stayed in. I just wish there were more channel options on the tv. The breakfast was nice and the eating area was clean. I definitely will be back. "Best Western Los Angeles Worldport Hotel"
Pretty basic hotel amenities but no gym and TV in the room had poor reception. Nice, friendly staff. I did not use the free breakfast but the room looked clean and pleasant. I also didn't use the small pool but it looked nice and well kept. The rooms are comfortable and well appointed. They are not too well insulated for sound. The hotel is in an industrial area with older apartments. It's not too far from a number of tourist attractions. We will stay there again. .
No TV service in room, broken a/c in room, 6-8 comforters stored between mattress and box spring, one single working outlet in room, internet out in lobby and broken lobby printer (unable to print boarding passes), generally dirty everywhere, unfriendly staff. Very disappointed in this location. Best Western is usually an impressive stay no matter where you go, except LA Worldport. Each location varies of their services and products.Well known franchise hotel should carry on their reputation around the globe. As former employee of Best Western, training for staff is mandatory in order to deliver good service. Customer Service was fast and easy and the girls at the front desk were professional and nice... nice lobby,pool,Jacuzzi, and free breakfast. Our room and bathroom were cleaned, bed and pillows were comfortable! I will definitely stay here again!!! "Good place to stay when visiting the port"
Very clean and recently renovated rooms. Queen and King rooms have sitting desk and working desk with excellent WiFi reception in rooms. Hotel is well managed with lots of parking. Rates are reasonable for this part of town. "Our stay at the Best Western Hotel"
We always enjoyed our stays at the Best Western Hotel. We used to always stay there in the past during our annual trip to Bremerton Washington for golfing. A couple of times we took our grandkids to Seattle Washington for shopping and leisure and stayed at the Best Western Hotel. I'm sure that in the future, we'll still stay at the Best Western as well as recommend it to some of our friends. "Rats, rats and more rats"
i chose this hotel do to it being close to the Hospital where my loved one was, but during my stay not only did i see one rat but more, the owner/ manager was not reasonable when i informed him of his issue. I immediately contacted the health department. "Good hotel with easy parking"
This hotel has easy parking and a pleasant staff that are very helpful. Breakfast is minimal as is expected for this level of Best Western. But the breakfast room is clean and nice. Rooms/bathrooms are outdated, but also as expected for this level of hotel. The Internet service was reliable and reasonably easy to access. It is tricky to enter or exit the hotel driveway due to the proximity to the freeway and that it is on PCH. The road is very busy (all the time), but is horrible at rush hour. Impossible to turn left during these times. On check-in night, a member of our party had a on-line reservation issue. The front desk staff was not particularly helpful and a friend of theirs was lying down on the lobby couch! The elevator was painfully slow and the stairwell from the 3rd floor led to the parking lot not the lobby. I'm giving a 2 star rating because the bed was comfortable, the continental breakfast was fine, and the cleaning staff were thorough. "Great Hotel for a small price"
I enjoyed my stay at the Best Western. The hotel is very clean and my room was cleaned everyday by housekeeping. I'm not sure about breakfast because I didn't try it. The only complaint I have is the entrance into the hotel. It's on a very busy street and it's hard to turn in with traffic. I have stayed at this hotel numerous times and have had great experiences each time. The rooms smell good even the smoking rooms. The beds are big and comfy, adequate tv channels, the windows actually open so you can feel the California weather. The halls were very hot on my last stay no biggie! The shower feels good, nice and hot. They need to do a better job for breakfast but there is however a Ihop next door, I've never eaten there though. Overall I will still stay there over and over. "Billed as "Plus," definitely not!" Great location if you want to get on Hwy 110 or Pacific Coast Hwy, but terrible for sleep. Cars peeling out and revving their engines all hours of the night, and this hotel is right at the intersection. While it was very clean, there are no real extra's. No coffee in the lobby, and breakfast isn't open until 7 AM. The coffee maker in the room only made one cup - for three adults? The TV selection was poor, and no guide was provided. No Best Western book in our room, so we didn't know what was nearby. No grab bar or mat in the tub, which made it a safety hazard. Breakfast was mediocre, just grab and go stuff. Only an outdoor pool which opens only to stairs (so not wheelchair accessible), and no workout room. There was a convenience store and gas station across the street - if you wanted to risk life and limb getting there! Otherwise, walking score was zero (nearest grocery was about a mile away). Definitely not worth the price. It is a great location for easy freeway access. The mattress was hard and worn, carpet needs to be replaced, bugs in the breakfast container. The parking lot is dark not well lite. Room lighting is a bit dim not very bright. "Good Value. Could improve a few areas." The pool area is much nicer than I expected. Very quiet clean and appealing setting with a nice mature tree that provides some shade. The rooms are a little dark and dated but clean and reasonable considering the price. Overall a very decent place. One thing that irritated me slightly was that they have nice big HDTVs in the rooms but no HD service. One of my reasons for booking was the TVs looked really good and I was a little disappointed that HD was not available. We booked another hotel in L.A., it was really terrible, later we changed into this hotel. It located in a nice place which is close to the airport, they have shuttle bus could send costumers to airport. But this hotel is not very close to the Universal Studio. L.A. has a little busy traffic, 30-40 mins from this hotel to Universal Studio. Nice employees, they're really helpful. Not bad breakfast. Worth to stay. "Hotel is ok except for the bed"
The staff was wonderful, but the bed was just awful. It was as hard as a rock and I left completely exhausted because I could not sleep. There were no other rooms available so I was given blankets to pad the mattress. I would have checked out and moved to another hotel but everything was booked. There is road construction in front of the hotel that makes entering and exiting difficult but my room was surprisingly quiet. I didn't have any problem with location, price and room! It's decent for amount of money that I pay! All things inside was working. We even have small refrigerator! Wish they have microwave! Reception was nice and friendly! We had small talked ask me what part of Florida I'm from, when she saw my Drivers lic! Inform me about continental breakfast! Next to hotel was Denny's ! Parking was easy no problem! Secure! Internet was free so I can't complain that sometimes is slow! Over all is good place to stay, I have 2 small kids with me and my husband! Good driving distance to all the place we visit! I can come back again for future use! The toilet was not flushing well. Front desk not friendly. When we visited they were working on the road in front of hotel and shut off water from 8pm-5am but hot water was shut off throughout the day. Unable to shower well. The toilet was never fixed and it took them an hour to come see it. We personally feel very comfortable coming to Best Western. This hotel is very cozy and consistent with their customer service and hospitality. Best Western will continue to be my first choice for my getaway experiences. The Staff is not helpful, bad internet, questionable food, and always remodeling with no visible improvement to the facility. It is hard to get into parking lot because the facility is next to the freeway. Very noisy hotel - needs better noise level struscture the windows need to keep the noise out not in the hotel needs to have better windows since the hotel is right off the fwy exit Kids running around at 7 am in the hallways I was there for a conference and never again will I recommend this hotel to any of my friends and family. "Quite Clean and friendly staff"
I look for a clean room; I found one; we will be back! You will not be dissatisfied with the quality of the room you are given. Breakfast coffee great; other items on menu I could take or leave, but...my interest was the cleanliness of the room and received this. "Decent hotel for short stays"
If you need a decent hotel for a short stay in the area and do not want to pay premium prices, then this is a good choice. I'm not wild about the location, but the hotel is clean, the staff is competent, and the rooms seem recently renovated. The breakfast is typical and OK. There are better choices in the area for more money but if they are booked or you are looking to save, this is your next choice. Pleasant stay with the exception of the bed. They need to replace the mattresses. Clean bathrooms. good breakfast and friendly people. Easy on and off the freeway. Check in and out was quick. Only place to eat close by is a Denys. "Handicap room on the 2nd floor." This hotel was adequate for our purpose. We were leaving on a cruise the next day and only needed it for 1 night. The room was clean but the A/C fan was making a terrible noise so we could not use it. My main concern was that the handicap room we booked was on the 2nd floor when I specified a ground floor room. In the event of a fire or earthquake, my husband would have not been able to get out as he cannot walk. Stayed here for a night. Breakfast was good, pleasant staff. Only complaint was that the tenants in the apartment building behind the hotel were VERY noisy throughout the night. And, I had a hard time connecting to the free wifi. I would definitely stay here again. The people were great, the suite outstanding and a really nice breakfast. Booked us in several hours early to large comfortable suite. When we were leaving very early before breakfast were given Danish and coffee. I was treated so well here. The staff is wonderful. I will be back again and again. I used all the areas like the pool, laundry, business center Etc. and all were clean and in great shape. I Would recommend this hotel if your in this area. The room is clean, well lighted and spacious. The room decoration is simple but more than acceptable. The internet connection worked fine. The staff is courteous and helpful. The continental breakfast is basic and plentiful. The hotel is next to a number of restaurants but also to a traffic light with busy traffic and the left turn to the hotel from one direction is not obvious. This hotel offers good value for the $$. "Average Stay - Manager Working Hard to Address Issues"
Older, well worn hotel. The lobby was very large and fairly unwelcoming - it seemed to need more furnishings. Our room appeared clean enough and the countertop to the vanity area seems to have been recently renovated. There was a nice size TV (42” perhaps) mounted to the wall and our room had enough space. The entire place could do with a remodel. The power outlets were not really accessible. There was nothing near the bed where I had to sit (the room didn't have an easy chair, only a table with two chairs and no outlets there either). There was no lobby coffee and no microwaves in room - but there was one in the breakfast area that the front desk staff would unlock for us to use. This microwave was super as it was 1200 watts and cooked our popcorn perfectly in 90 seconds. Internet was not very robust and I could not stream videos. There were no grab bars of any kind in the tub - we didn't feel very secure using it. The sink area is in the main part of the room and had a generous vanity that also held the in room coffee items and the ice bucket. The smoking rooms are on the top floor so, if you are a nonsmoker you won't want to be there. Our bed was interesting as it shook every time one of us moved or coughed. The mattress looked different than anything I've seen in a hotel before and it reminded me of those I've seen in university residence halls. We would have done much better with two beds. Hal, the manager was very understanding when I explained the issue and he said he'd be replacing the bed in our room (324). He was very concerned about our discomfort and I was impressed by his reaction. If two people will be occupying the room, I'd recommend checking the bed immediately or opt for a room with two beds. Breakfast was continental but sufficient. They had cereal, a waffle maker, hard boiled eggs, oatmeal packages, Yoplait yogurt, breads for toasting and sweet rolls. Nothing else was really needed. car broken into and 2 carryons taken. GenMgr never was in attendance or called me. $230 to repair window and not a word about their culpability. I asked to park in front-they said no park in underground spots. My room was located next to stair entrance. Through the night I become aware of the stair door being closed. The noise was a very short metalic sound, yet loud enough to wake me up from my sleep. The interruption occurred at least 10 times. "Ok Stay at the BW"
Good place to stay for a couple nights. Right next to the freeway and close to the beach. The surrounding area really has nothing special to offer. The rates were very reasonable and the rooms were good. I enjoyed my 2 night stay at the hotel but encountered only one problem, I found some blood stains on the bed sheet after the first night and that was the only turn off. Everything else was good except that. I would still return, I would just check the sheets beforehand. "Nice stay and helpful staff"
Enjoyed our stay We left our vehicle there while taking a two week cruise. Have booked this hotel again for a future cruise. Very helpful staff. Breakfast area could use more seating. A bit difficult to get to this hotel as you must make a U-turn on a busy street. "Location of Hotel is central to my So Cal Family"
Staff was very helpful in describing area and how to travel within Wilmington.This area was very different from when I was a child and I was trying to locate my grandparents' home which is so very near this Best Western. We will return. This hotel is alright. Does need updating. Despite it being holiday the hotel was quiet which was nice. Room itself is outdated and needed a new mini fridge and coffee maker. TV was old and has less than 30 channels with nothing on. Atleast the wifi was decent. I don't like the 2 sided door sign with one that do not disturb and the other says please clean. I think people go by and flip them over because I got a knock my door from housekeeping. There is plenty of parking and they have luggage carts. I'd maybe stay again if they improve the hotel. "NOT BAD, BUT NOT WONDERFUL"
Had business in the area, its very conveinient to the cruiseship terminals. The rooms are fine, good furnishings. The manager was a bit pushy, getting in my business, and following me around. Suggesting I go inside and eat something. I found that a bit off-putting. Their 'continental breakfast' is nothing more than: stale packaged muffins, apples, sugary juices and rank coffee. If thats your idea of "breakfast"? GREAT! However right next door, is a 24hr. DENNY'S. I liked the hotel, however not too pleased about the Manager, talking to me like I'm stupid, and making "notes" of my commings-and-goings. Very friendly hotel staff! The AC wasn't working in our original room. We were moved from our room and upgraded to a VIP Suite in less than 10 minutes. Wonderful customer service! Great location also. "Great place to leave your car when cruising from Los Angeles CA at San Pedro Worldport"
Nice hotel for the purpose of leaving your car when taking a cruise. For a one night stay you can leave your car for up to 14 days. They do not offer shuttle service. We take a cab to the port. Much more convenient. With tip taxi fair around $20. When we return another cab back to the hotel to get the car. Easier than waiting for a hotel shuttle bus. Breakfast we skipped but went next door to Denny's instead. Room nice size, comfortable bed, good shower. Getting there off the 110 on to Pacific Coast Highway a little tricky, busy corner. My GPS made me turn left (east) on PCH but coming south make a right onto PCH, hotel on the left after you turn next to Denny's. "A place Where the Parking pays your way"
"Good hotel in its class"
We were visiting grandchildren in the San Pedro area and normally stay in the Best Western Plus on Gaffey St., but even though we'd booked several months in advance, that hotel did not have 5 consecutive nights open during our visit. Good medium-range price hotels are rare in the port area so we booked a room at Best Western LA Worldport only 10 minutes north of our son's house. The location is a very busy one (almost under I-110) so we asked for a far room. The first problem was the king bed. Every time one of us moved, the other would feel it like an ocean wave. The second problem presented itself at 2:00 a.m. when very loud noise from a party in the adjoining room filtered through the door. (Avoid adjoining rooms.) We called management but the noise continued another hour. Next morning we spoke with the Manager, Hal, and he addressed the situation immediately. He took time to speak with us at length to determine the problems and took immediate action. Our room was changed to a quiet, non-adjoining type room and we heard no more noise for the rest of our stay. Hal had housekeeping exchange the mattress in the new room for a new mattress from their warehouse next door and, although it was slightly less 'wave-inducing' than the first one, still did not come up to the standard of mattress a hotel of this caliber should be using. That being said, we slept quite well the next four nights, in part because we felt Hal addressed our complaints with quick action and empathy. Thank you, Hal! I stayed on the fourth floor which was a smoking floor unbeknownst to me, it reeked from the smell of a party from 1969 if you catch my drift dude. I complained to the desk but know one seemed to care. "Quick stop overnight for flying out the next day." The location was within 45 minutes of the airport which was what we were looking for. Our room request of a top floor was granted and even though we didn't use the pool we would have if we had more time. Staff was kind and courteous. I was able to book, for the best rate, a smoking room at this visit. The last time I stayed it was a non-smoking room. I want to complement the staff that I did not notice any offending odor of smoke in the room. Thank you for that. The only difference is the bed covers where not as nice as the non-smoking rooms. I can completely understand why this may happen. The internet speed was GREAT. Though it was a Family travel deal I was able to pop into my work server and get a few things done. Thank you making the internet available. "Excellent Hotel in Los Angeles"
Hotel priced right, in the area of LA we were visiting to spend time with family. Only drawback was parking was tight for a pickup as most was for compact vehicles and the hotel was located on a corner so it was tough getting in and out of lot onto the street due to traffic buildup at the light. This staff at this hotel were very friendly and attentive. The rooms were clean and somewhat updated. The location is close to many LA and Long beach attractions. Area is just a tad bit dodgy, but overall great experience!